Reach for the clouds on our exclusive Colosseum tour, which takes you behind the scenes at the most iconic building of ancient Rome with our English-speaking expert guide. 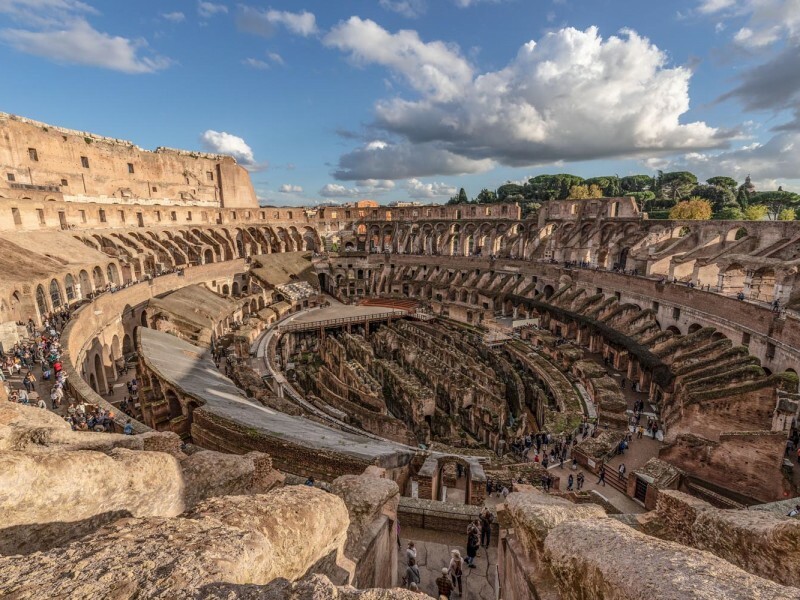 Skip the lines and go through a VIP fast security check and get special access to the Colosseum’s usually off-limits third, fourth and fifth tiers where you’ll enjoy panoramic views into the arena, as well as the ancient and modern city spreading out towards the distant horizon. It's only from here that you can truly appreciate the incredible complexity and functionality of the amphitheatre's unique architecture. Our Colosseum Belvedere tour is a unique opportunity to discover what took place during the brutal gladiator battles on the arena far below as you climb to the very top. Don’t forget your camera, because the views from the Colosseum’s aptly named Belvedere (Italian for 'beautiful view') are amongst the most spectacular in the whole city. 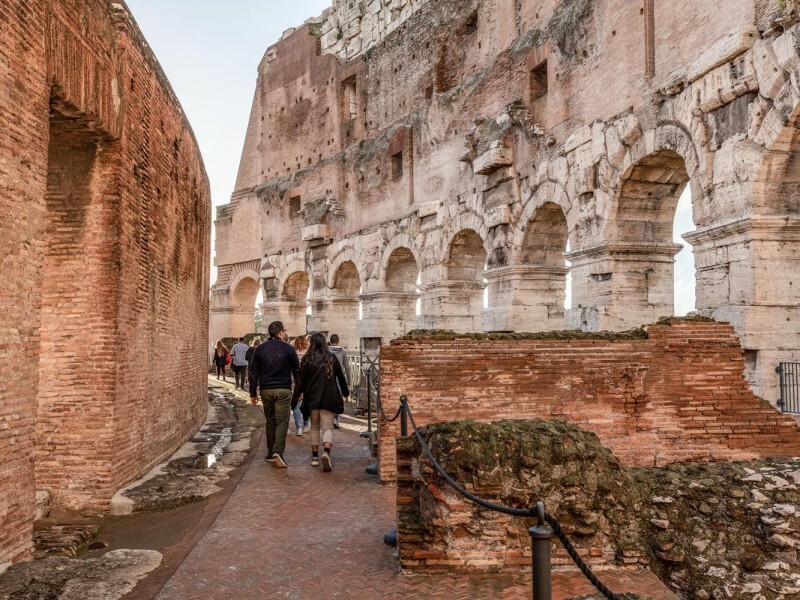 Afterwards our tour continues into the heart of ancient Rome as you explore the temples and courthouses of the Roman Forum, as well as the opulent palaces on the Palatine Hill that the all-powerful ancient emperors called home. Book now to ensure your place on this special Colosseum experience! If you have a head for heights and love spectacular views, then our Colosseum Belvedere Tour is for you. 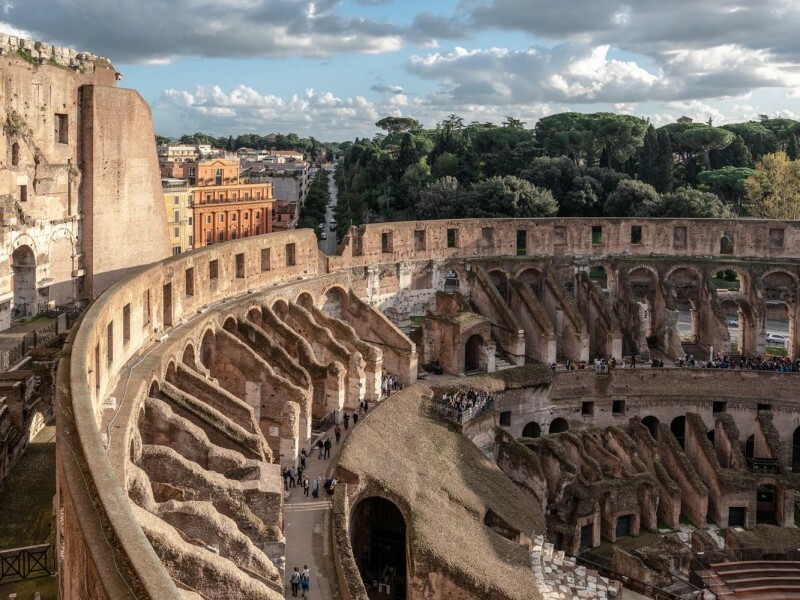 Skip the lines and security checks and get special access to the restricted top levels of the Colosseum where you’ll enjoy incredible vistas of the iconic amphitheatre and the valley of the Roman Forum spread out far below. 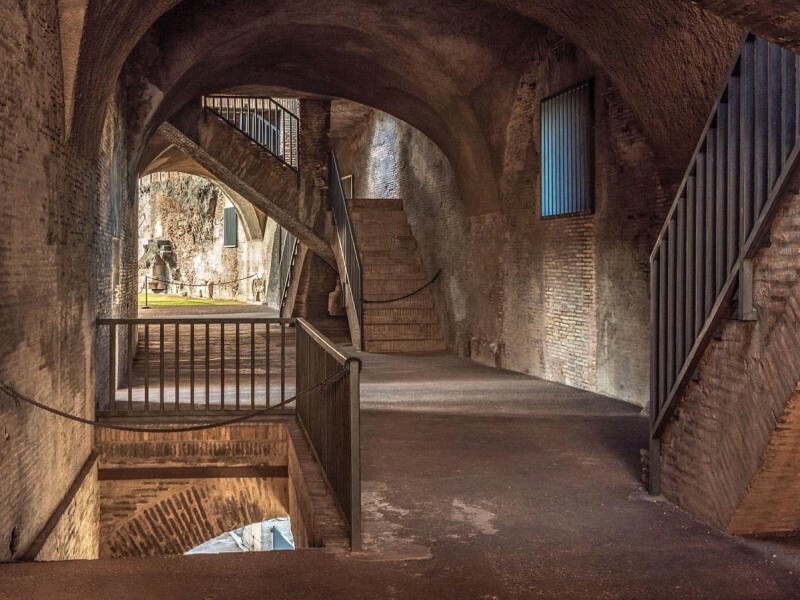 The unforgettable highest levels of the Colosseum are the most exclusive areas that we can visit today, but in ancient Rome things were very different. The emperor and his retinue savoured the gore from the ringside Imperial box, whilst the Vestal Virgins and senators were so close to the action that they were often spattered with blood during the games. The third tier was instead the haunt of male commoners, whilst the fourth and fifth levels were crowded with the lowest status citizens of Roman society (including common women and slaves) clamouring to get a glimpse of the spectacle. But time changes priorities, and our Colosseum third tier tour takes you where the VIPS of the past (senators and magistrates) would never set foot. 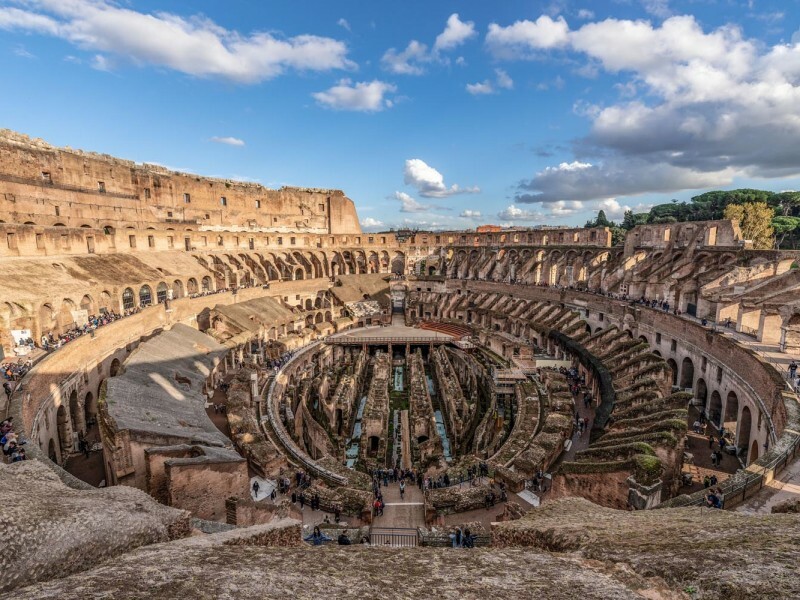 As you ascend skywards you’ll experience this fascinating history first-hand - learn how the Colosseum was built and how the bloody gladiator contests on the arena below unfolded. It’s quite a climb to reach the very top, but when you finally step on to the dizzying fifth tier with only birds gliding in the breeze for company we promise it’ll be worth it! 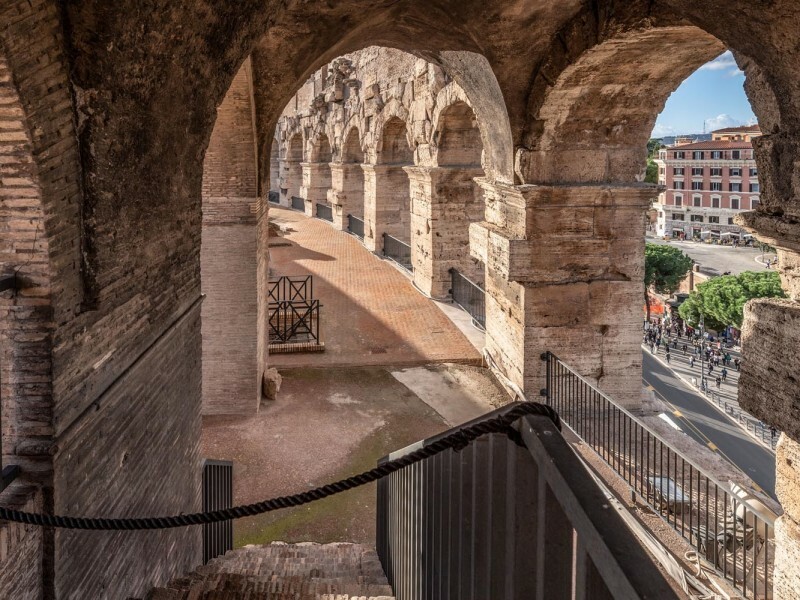 Admiring sweeping panoramas of the city over the treetops and a fabulous perspective of the arena and underground level of the amphitheatre far below, you’ll see why this is known as the Colosseum’s belvedere (Italian for ‘beautiful view’). Make sure to bring your camera, because these might just be the most memorable holiday photos you ever take. 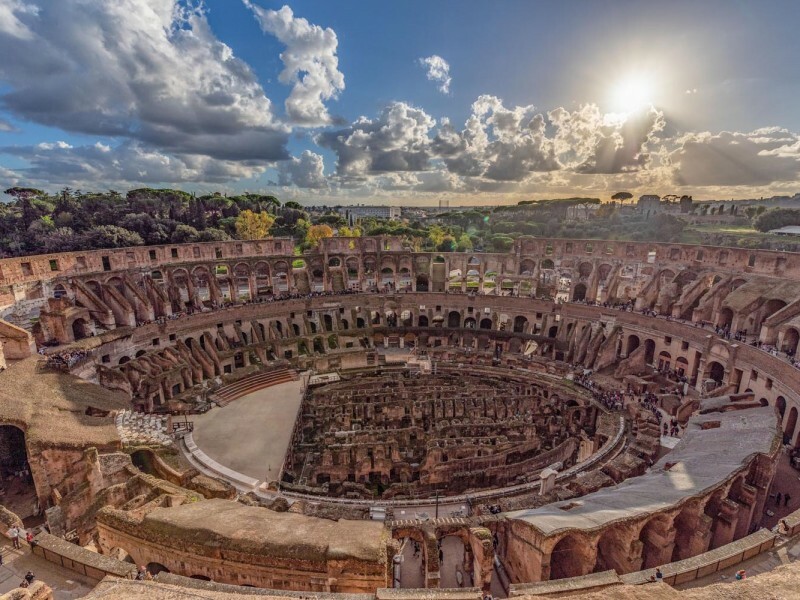 From the fifth level discover how the Colosseum boasted a retractable roof just like today’s state-of-the-art sports stadiums. This massive adjustable canopy that protected the audience from the blinding Roman sun, allowing them to drink in a day of blood-sport in shady bliss. An opening at its centre meant that even whilst the spectators were covered the action taking place on the sand of the arena was open to the sky and dramatically spot-lit by the sun. Because of its resemblance to a giant ship’s sail, the canvas roof was known as the velarium - Latin for sail. Expert sailors from the naval fleet operated the awning from posts at the very top of the Colosseum, and you’ll get an amazing close-up look at the corbels that supported the 240 massive masts that carried ropes supporting the sail above the arena. After exploring the exclusive third, fourth and fifth tiers your tour will continue into the Colosseum below. From there you will have the chance to uncover the secrets of the Roman Forum with your guide, deciphering its ruins and discovering the beating heart of the ancient city’s civic, economic and religious centre. Discover the eccentric pantheon of Roman gods in the spectacular temples dedicated to their worship and pop in to the beautiful House of the Vestal Virgins, whose sacred task it was to keep Rome’s eternal flame alive; relive dramatic political intrigues in the Senate where Caesar, Cicero and Augustus made their mark and walk along streets unchanged for millennia, still scarred by the wheels of ancient carriages. 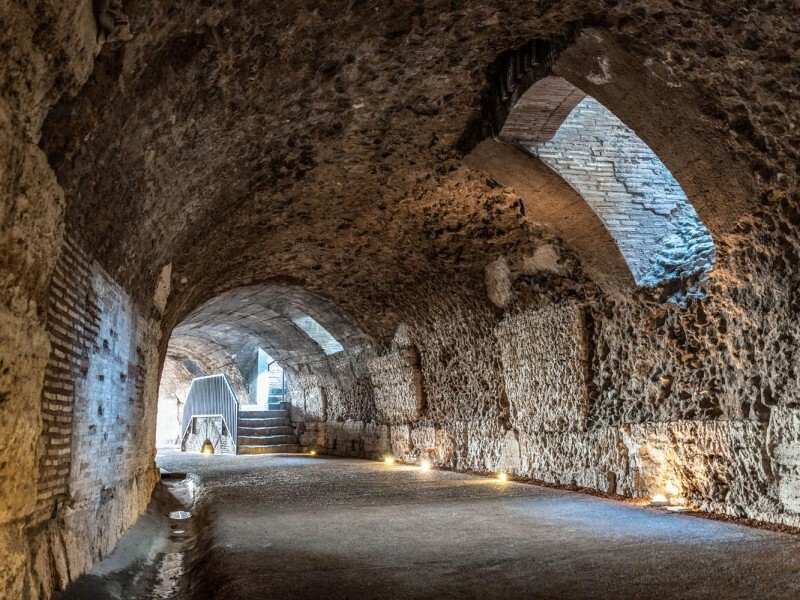 Finally explore the monumental remains of the Imperial palaces on the Palatine Hill, where despotic and capricious Emperors ruled Rome with absolute power, lording it over the city’s populace from the most privileged vantage point in the metropolis. Book your place on our Colosseum in the Sky tour today and get the inside track on the ancient world’s greatest city. In Rome history is alive – experience it for yourself! Special access to the Third, Fourth and Fifth Tier. Maximum group size of 24 people or fewer. At the Arch of Constantine. You will receive full details, including a map and photo on booking. This is a walking tour, taking you inside the Colosseum and through the archaeological sites of Ancient Rome. There are a lot of steps and uneven surfaces. Wear comfortable shoes and bring plenty of water. Being a group tour everybody will move in a certain pace together, if you have limited mobility, please contact us before booking.